Got the lcd in the mail today and after a few spatial turnings of the display in my mind, i hooked it up. Bladow! I have a CZ-1 and i actually find the display quite dull. Is that normal behavior. Thinking of replacing it, but it is a bit different - backlight. Can i just use a standard HD-47780 compatible 16x2 LED backlight display? Here's mine, I finished installation this afternoon. I bought it on ebay for 3,50€ and it works fine despite a bit too heavy contrast. Reference : 1602 16x02 HD44780 - screen ARDUINO E061. It's a pleasure to see the display in low light. The Cz 101 schematics from the service manual shows a Contrast variable resistor VR3 10K. 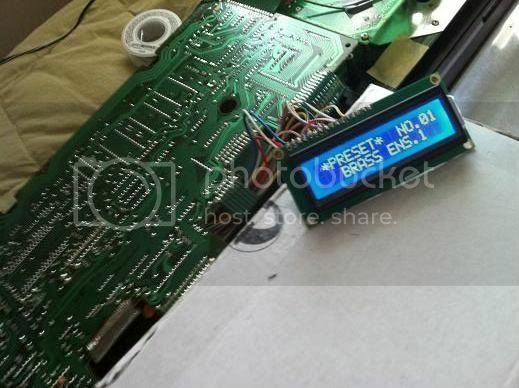 Saw it some where on the pcb near the 14 - pin LCD socket.